The Home screen went through a renovation and now has a modernized look. 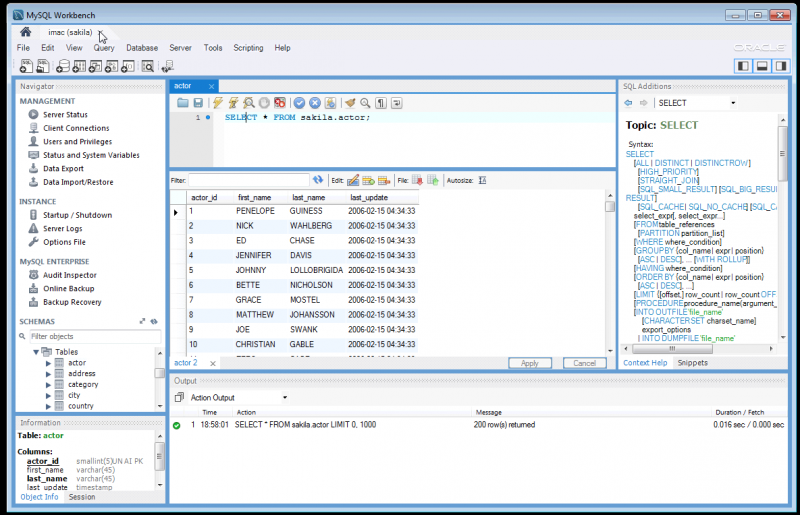 As part of the SQL Editor and Administration GUI unification, there’s now a single list for MySQL connections. Recently opened model files and other major features are also accessible from it. You can organize different connections into “folders” by right clicking on a connection and selecting “Move to Group…” in the context menu. New server connections can be added by clicking the + button next to the MySQL Connections heading. By clicking the Configure Remote Management… button in the new connection setup dialog, you can add server management capabilities to the connection. As before, SSH access with “sudo” is needed for remote management. The wrench icon next to the heading brings up the connection editor, which lets you change connection and management parameters from an editor interface. Configuration was simplified compared to 5.2. 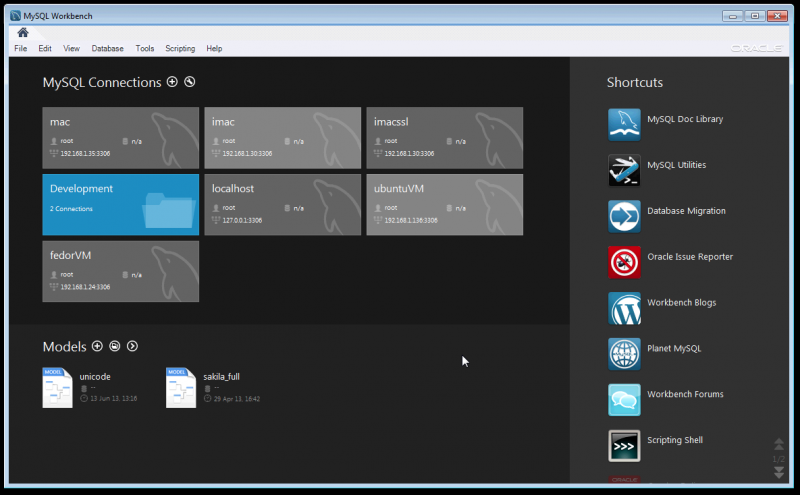 In MySQL Workbench 6.0, the SQL Editor and Administrator interfaces were merged together. You can now access administration functionality, such as restarting the server or listing connections from the same database connection tab. The primary sidebar now has both the familiar Schema tree and the administration items. If you’d like more space for the Schema tree, you can click the expand button next to the SCHEMAS heading and give it more vertical space. Schema Inspector, allows you to browse general information from schema objects in the server. 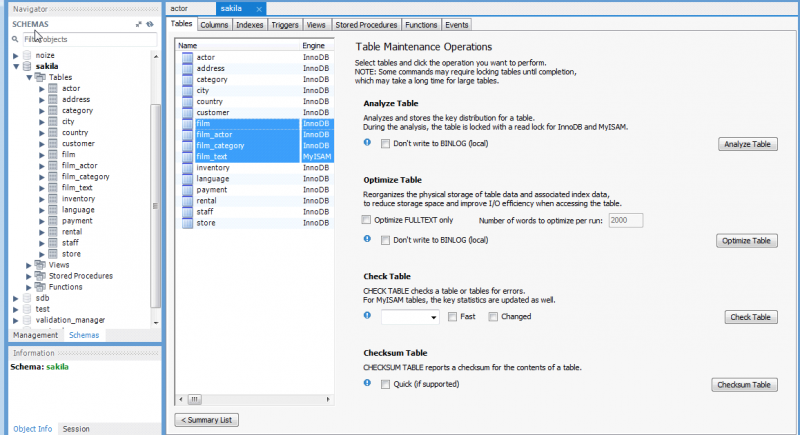 For tables, there’s also a Table Maintenance panel, from where you can perform maintenance tasks such as ANALYZE, OPTIMIZE, CHECK and CHECKSUM TABLEs. 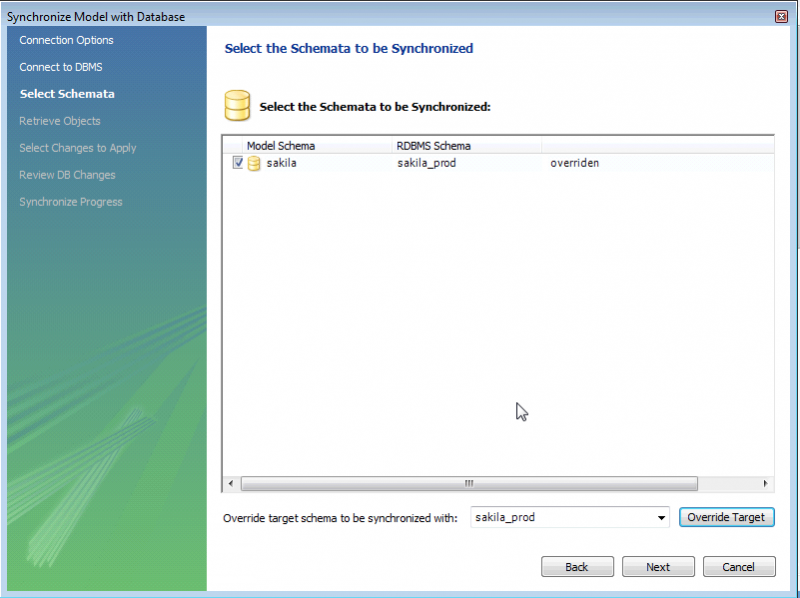 To access, right click a schema and select Schema Inspector. You can select schemas and/or tables to perform client-side searches for arbitrary strings and patterns on their contents. If you find yourself wishing for more control over the default column definition and often create tables having the same common set of columns, you can now create templates for them. 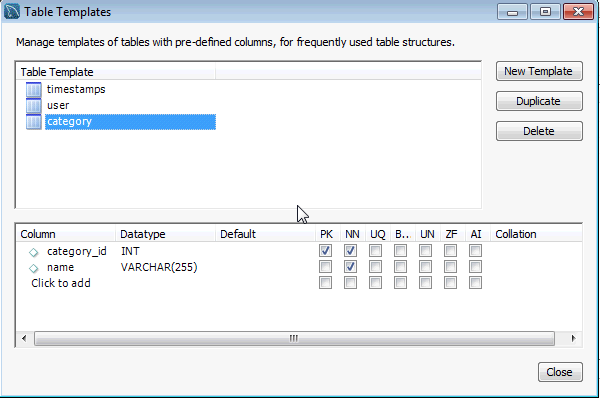 The same templates can be used in the SQL Editor and also in the EER Modeling tool. More information about your server in a glance. Online, context sensitive help is available in query editors. 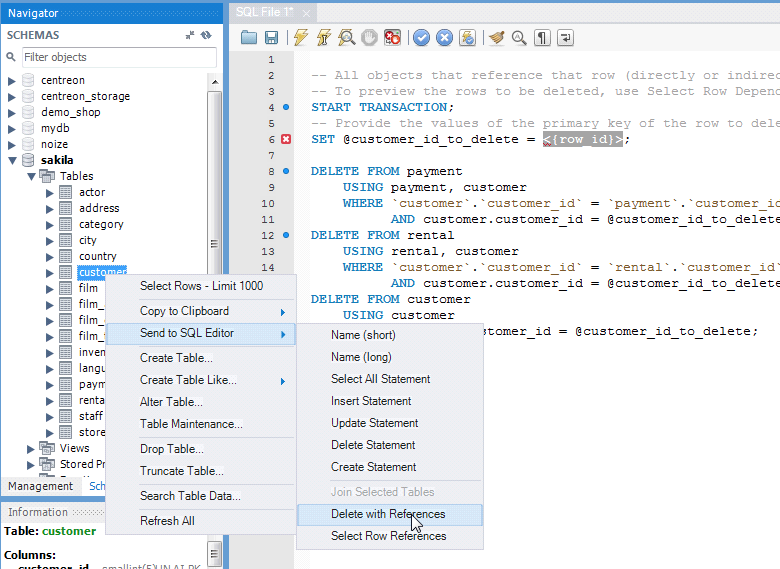 Place the cursor over a SQL keyword and the help tables in the server will be queried for it. This is equivalent to the HELP keyword from the command line client. To disable help, hide or switch the sidebar pane to a different tab. A new text mode, vertical query output was introduced. This is equivalent to the \G option from the command line client and outputs the results of a query laid out in Column/Value pairs, one value per row. This improves readability of certain types of resultsets. Ctrl+G/Cmd-G can be used as a shortcut for that command. You can now generate the list of DELETE statements that would be needed to delete a given row from a table, in case there are other tables with foreign keys that reference them (which would prevent the row to be deleted). Select a table in the Schemas tree and from the context menu, select Copy to Clipboard -> Delete with References. A similar feature for SELECT statements will generate the queries that would list the rows to be deleted from other tables. The log file viewer was improved for when browsing files that are not readable by the current user. DB modeling got several bug fixes, specially in Synchronization. You can now Synchronize a schema with another having a different name (like sakila in your model vs sakila_test in the server). 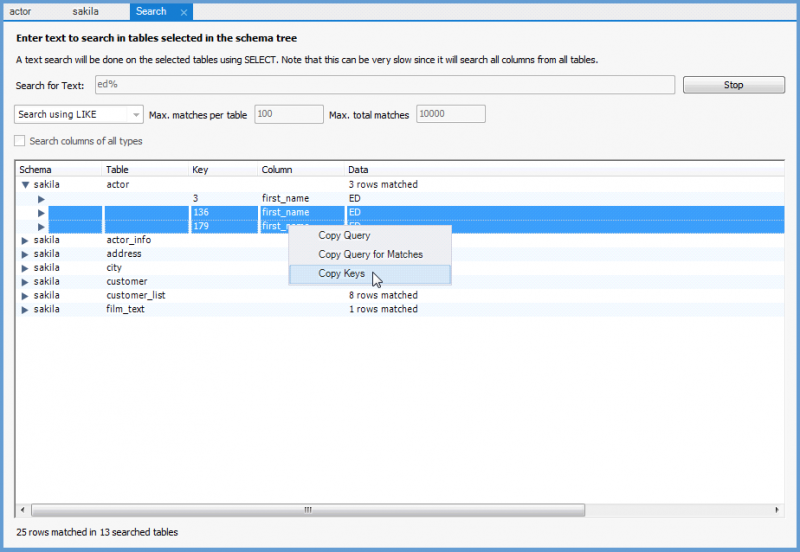 You can also fix object name mapping issues (when a table or column cannot be automatically recognized as being the same, because of renames) using the new Table and Column Mapping editor. Syntax Highlighting was also added to the various places where SQL code is visualized. 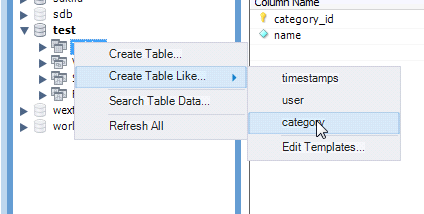 Quickly add tables using table templates, having any number of columns with the attributes you want. A standardized toolbar was added to all SQL code editors, where you can export/import files, reformat the SQL, perform find/replace etc. This should get you started with the new stuff, but we’ll keep posting articles with details about each feature in the coming weeks, so make sure to come back for more info! Overall love the new version over the old. But as always, a few future enhancements. SQL Scripts: Not sure what they are and why the are here. If you push them to files do they stay in sync? Why can’t they be named to explain what they do? When and which order are they used? As source code for the DB install; naming, linking to a source file, or linking to a table or two as reference would be valuable. Even linking in as a Pre or Post SQL would be valuable. Views: Views should show column names. Not good in the diagram without them. Also should show linkage to source tables (even if I add them manually) just helps with documentation. In many models, it the view layer that controls what data is used in reports. So this is as important as the physical structure. SQL Scripts are just for keeping related files together with your model. Currently there is no integration for them supported, although we’ll be working on that in the future. Yes, we have feature requests for parsing and displaying view columns, although that’s a little trickier than for tables. I’m try to install the workbench in my system, it’s installed.But i can’t use the workbench. when i start the mysql connection closings suddenly. i’m using centos linux 6.0 1.8 GB RAM,500 GB hard disk. please give me suggestion. In MySQL 6.0, the Result Set Filter was more dynamic. It would return results as I was typing. It now only works when I press Enter, and it returns NULLS for for each row, where there isn’t a match. The previous version did not return the NULLs. This is not a welcome change.